One Last Reminder – Is the Drain Plug In? Invasive species regulations are now in effect in many states and many of them now require boaters to remove the plug and drain the bilge and live well before transporting a watercraft. In our Basic Boating Safety Course we have an extensive section on trailering and one of the things we emphasize is to make sure the drain plug is in before launching your boat. The majority of recreational boats in the United States are trailered to and from the water. Your boat trailer is only one part of the entire boating package, which includes the boat, trailer, hitch and towing vehicle. Neglecting the trailer’s maintenance can result in damage to your boat, your towing vehicle or both. Below is our check-list for launching. Do initial launch preparations away from the ramp so as not to impede launching for others. Raise the outdrive or motor, remove the support bracket and install the drain plug. Disconnect the trailer wiring. Remove tie down straps and again check the drain plug. Make any equipment adjustments necessary and check the drain plug. Connect the fuel tank, check fluid levels and check the drain plug. Drive to the ramp and back the boat and trailer down the ramp, keeping the tow vehicle’s wheels out of the water. Set the emergency brake, shift into Park, and block the wheels. Someone should get aboard the boat, turn on the blower, lower the motor, look for water entering the boat, (in case you forgot to check the drain plug) sniff the bilge and start the motor. Make sure you have attached a bow line to the boat, then release the winch and disconnect the winch line. You should be able to launch the boat with a slight shove or by backing the boat off the trailer under power. Return the towing vehicle to the parking lot as soon as the boat is launched so the next person in line may proceed. Move the boat to an area away from the ramp to load additional equipment and passengers. Many outdoor sportsmen and women enjoy the winter months but there are certain things that you should be concerned about when recreating on ice. The following information is courtesy of the Minnesota DNR. Remember that these thicknesses are merely guidelines for new, clear, solid ice. Many factors other than thickness can cause ice to be unsafe. 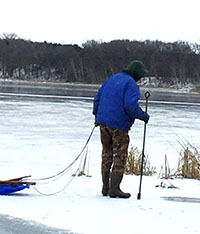 No matter what you are going to do once you get on the ice – like fishing, snowmobiling, skating or even ice boating, it’s a good idea to contact a local bait shop or resort on the lake about ice conditions. It’s also important to do some checking yourself once you get there. 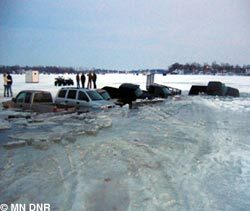 Several factors affect the relative safety of ice, such as temperature, snow cover and currents. But a very important factor is the actual ice thickness. The ice chisel or “spud bar” is one of the oldest methods of making a hole in the ice. In its simplest form, it consists of a metal rod with a sharp, flat blade welded onto one end that is driven into the ice in a stabbing motion. Depending on the sharpness of the blade, the thickness of the ice and the strength of the user, it can make a hole in the ice fairly quickly, especially when the ice is less than a foot thick. There are several varieties of ice auger. Some people like the hand auger for its low cost, light weight and low noise factor. The disadvantage of a hand-powered auger is that after a few holes, operator exhaustion becomes an issue. Some folks like an electric auger, with its low noise level rivaling a hand auger, with the advantage of a lot less work for the user. An electric auger does, however, need an external 12-volt battery, which can be something of a nuisance to lug around. Gas augers boast the fastest speed in drilling through the ice, but are heavier, noisier and generally more costly than hand or electric models. There is one tool, that many households have hanging on the pegboard in the basement or on a shelf in the garage that can make checking ice thickness a quick and easy task – a cordless rechargeable electric drill. With a cordless drill and a long, five-eighths inch wood auger bit, you can drill through eight inches of ice in less than 30 seconds. Most cordless drills that are at least 7.2 volts will work, but the type of bit is critical. You need a wood auger bit since they have a spiral called a “flute” around the shaft that metal drilling bits don’t. The flutes pull the ice chips out of the hole and help keep it from getting stuck, much in the way a full-sized ice auger works. It is important to dry the bit and give it a quick spray of silicone lubricant after each use. Otherwise, the next time you open your toolkit, you’ll find your once shiny drill bit looking like a rusty nail! Some people claim they can judge thickness by where the chisel or drill suddenly breaks through, but that happens so quickly, it’s easy to overestimate the thickness. 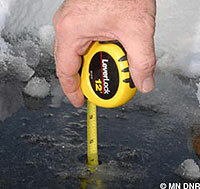 It’s smarter to use a tape measure or something like an ice fisherman’s ice skimmer handle with inch markings to put down the hole and hook the bottom edge of the hole to determine the ice’s true thickness. Ice is seldom the same thickness over a single body of water. It can be two feet thick in one place and one inch thick a few yards away due to currents, springs, rotting vegetation or school of rough fish. You need to check the ice at least every 150 feet, especially early in the season or any situation where the thickness varies widely. Recommended minimum thicknesses for new clear ice. 8″ – 10″ Small to medium cars, and pickups. Many states are beginning a proactive approach to enforce laws that many boaters may not even be aware of. The effort aims to assure that boaters do not accidentally spread Eurasian water-milfoil, zebra mussels, and other aquatic invasive species to other bodies of water. Inspectors will be stationed at various bodies of water to help boaters understand invasive species laws and what they must do before leaving that body of water. Aquatic nuisance species (ANS) are non-indigenous species that threaten the diversity or abundance of native aquatic species. Two such ANS are the Zebra mussel and the Quagga mussel. Great Lakes water users spend tens of millions of dollars on zebra mussel control every year. Zebra mussel infestations cause pronounced ecological changes in the Great Lakes and major rivers of the central United States. Non-indigenous aquatic nuisance plants, such as purple loosestrife, Eurasian water milfoil, giant salvinia and hydrilla quickly establish themselves. Environmental and economic problems caused by the dense growth of these weeds include impairment of water-based recreation, navigation, flood control, water quality and fish and wildlife habitat. Invasive species can crowd out native species, disrupt lake ecosystems, and interfere with boating, fishing and other recreation. The main way that invasive species and fish diseases such as viral hemorrhagic septicemia (VHS) spread to new waters is aboard boating and fishing equipment, boat trailers, water in livewells and live fish being moved from one water body to another. Drain all water from vehicles, trailers, watercraft, containers, fishing equipment, and gear when leaving any state waters or its shores. Do not take live fish away from any lake or its shores. A fish is considered dead when it is no longer in water. This law applies to shore anglers as well as those who fish from a boat. Remove all aquatic plants, animals and mud from watercraft, trailers and vehicles before leaving a landing for the day. Do not transport a vehicle, boat, boat trailer, equipment, or gear of any type on a public highway which has an aquatic plant or animal attached to the exterior. Use minnows left over after a fishing trip again on the same water OR on any other waters if no lake or river water, or other fish was added to their container. After a few futile hours at the pond with a fishing-rod many begin to wonder what it would be like using one’s smartphone to see where all the fish hide. Friday Lab created the first smart sonar Deeper in the world both for amateur and professional fishermen. It is the sonar that can show you where to look for fish directly on the screen of a tablet computer or a smartphone. If you could not brag about great catches until today, with Deeper you will always bring fish home. Deeper is a smart sonar for smartphones and tablets supporting Android 2.2+ and iOS 4.0+ operating systems. The smart sonar works in the depths from 0.5 m to 40 m and uses Bluetooth connection to display the information about the fish, the pond bed, water temperature and obstacles you may bump into, on the screen of a phone or a tablet. With Deeper sonar you can go angling in any weather: the device works in the temperatures from -10 to +40 degrees. When angling from a boat, a coast or a bridge, you can observe the situation on the screens of your smart devices within 50 m radius. Deeper turns on and is activated only when immersed in water, that way it extends its working time so in unfavorable conditions there is no need to take off your gloves or other protection to get a grip on small operational buttons. Deeper sonar is very compact and ergonomic, being only 6.5 cm in diameter and made in such a way that it cannot be damaged by water. The sonar is resistant not only to water, but also to small shocks. The lithium ion battery ensures about 6 hours uninterrupted operation of the echosounder and Deeper can be charged using a conventional Micro USB cable. 1. Inflatable life jackets are zero maintenance – Let’s face it, pretty much nothing on a boat is zero maintenance. Before you head out for the day, simply check to ensure the CO2 cylinder is screwed firmly in and you can see the green indicator tab. Once a year, take it out and blow it up with your mouth, wait overnight, inspect for wear and check for leaks. Repacking is a task made simple – a few folds and a tuck – as instructions are found printed inside the cover flap. Most life jackets that automatically inflate when you hit the water also have small dissolvable components that periodically need replacement, but it’s a simple process. A rearming “kit” comes with everything you need. 2. One size fits all – While most inflatables are sized as “universal adult,” all have adjustable cinch straps that will provide a good fit for nearly every size of grown-up on the boat. Inshore-type jackets tend to be less bulky and are more compact than those jackets designed for offshore use. There are no inflatables for kids under 16, but the BoatUS Foundation is working with other national boating safety groups and the US Coast Guard to increase support for inflatable jackets that are more suitable for kids. 3. Not a lot of choices – Actually, there are. Once you get past a range of colorful designs, there are two basic styles of inflatable life jackets: over-the shoulder suspender-style and waist-fitting belt pack. All US Coast Guard-approved inflatable life jackets have a mark showing its type and how it should be used. A big advantage is that inflatables can provide nearly twice the buoyancy of similarly-rated foam life jackets, and are also are better in terms of righting a person in the water, when compared to some other traditional types. 4. Inflatable life jackets are too expensive – Inflatable life jackets start at under $100. That is a real expense for some, but consider that a cheap life jacket that no one will want to wear is as useless as a hook without the worm. Belt pack types tend to be less expensive than suspender style, while automatically-inflatable types or those with extras like an integral sailing harness increase the price. 5. Inflatable life jackets are uncomfortable -Inflatable life jackets are compact, don’t trap body heat, give full body movement, and can be as unobtrusive as small bait pouch attached to your belt. Look for one that has a neoprene chafe guard around the neck and one that can be adjusted to prevent it from shifting from side to side. Would you give up your annual state fishing license if the government offered you $500? How about $250? How about $15? That’s what the National Oceanic and Atmospheric Administration (NOAA) Fisheries Service is trying to find out in an unusual survey being administered this year in Massachusetts. Working with the state’s Division of Marine Fisheries and the statistical research and analysis firm Quantech Inc., NOAA Fisheries Service sent surveys to 1,900 Massachusetts sport anglers who hold recreational saltwater fishing permits, asking them for information on the value they place on sportfishing. A total of 500 anglers who get the survey are being asked if they would give up their sportfishing licenses in exchange for a real cash offer — with an actual check in the mail that ranges from $15 to $500, depending on the angler being surveyed. If the angler opts to cash the check, he or she must surrender the saltwater fishing permit. According to NOAA Fisheries Service, the goal of this unusual offer is to better gauge the “true value” of a sportfishing license. In a statement about the plan, NOAA said most economic studies of saltwater recreational fishing estimate the number of jobs and the amount of sales and income supported by the spending of sport anglers, but they have not included the value anglers themselves place on being able to go saltwater fishing. “Being able to improve evaluation methods by comparing responses to real offers with responses to hypothetical offers will be a great benefit, and that’s what this study is intended to give us,” said Scott Steinback, an NOAA economist who designed the study. “Studies like this have been done to value other kinds of intangible benefits like recovering endangered species or valuing open space, but I think this is the first time it has been used to value the pleasure and satisfaction derived from recreational fishing,” he said. The federally funded survey will cost $145,000 — and $75,000 of that will go to pay anglers who opt not to go fishing. However, Steinback said, the focus of the study is about measuring the value of recreational fishing in Massachusetts, and it is not an attempt to raise fishing permit fees or restrict sportfishing activities. Early response to the plan from anglers has reportedly been mixed. The Massachusetts Division of Marine Fisheries had to send out an email advisory to anglers statewide to assure them that the survey and the cash offers being made were legitimate, and that the survey was not a scam. Order by Tuesday, December 20, 2011 to assure delivery by Christmas. Order will be shipped priority mail. 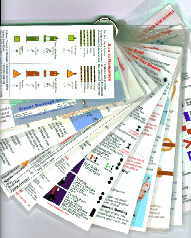 Skipper’s Onboard Source– The information you need to know (and carry with you) in a portable, waterproof format.A “flip book” of 18 laminated pages (3.5″x9″) to carry onboard, covering aids to navigation, dayshapes, running lights, sound signals, rules of the road, weather, signal flags, radio procedures, required equipment, etc. For details and ordering click here.